V-cube officially releases brand new visual communication platform, “V-CUBE One” | V-cube, Inc.
V-cube, Inc. (HQ: Meguro-ku, Tokyo, Founder & CEO: Naoaki Mashita) will officially release a brand new visual communication platform – “V-CUBE One” – as of September 1st, 2014. 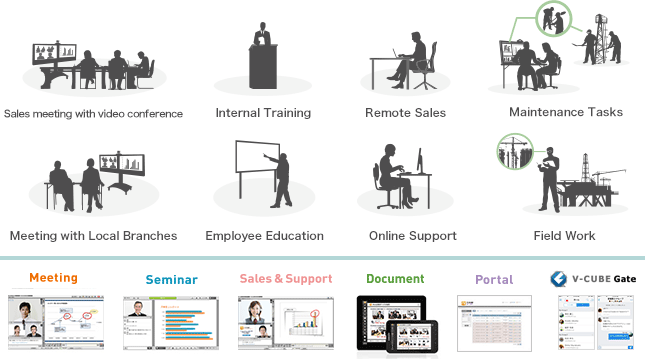 V-CUBE One is an all-in-one solution combining the best of V-cube’s services such as web conference, web seminar and online support, and it is aimed to provide users with more flexibility and variety when using visual communication services. V-cube’s proposition of visual communication is to resolve the issues of traveling between locations by enabling audio and video communications between remote locations. V-cube’s visual communication services support users in many various occasions such as internal meeting between branches, training, customer support, partner product training etc. The visual communication market is expected to grow rapidly in the near future. The reason being the increasing popularity of smartphones and tablets for enterprises, and this has widened the range of use of smart devices. Enterprise, manufacturers, pharmaceutical, government and education sectors are using visual communication services for fieldwork, remote education, tele-healthcare and many other use cases specific to the industry. On the other hand, the concept of web conference has been recognized as a tool for internal communication, which as a result, limits the true potential of visual communication. However, due to the increasing popularity of smart devices and the improved internet cloud environment, V-cube looks to provide visual communication solutions for “anytime, anywhere, anybody”; and create needs not only for enterprise internal communication but also a variety of industries and use cases such as training, education, tele-healthcare and many more. In order to simplify the process of enrolling in V-cube services and avoid unnecessary confusion with different features and pricing, V-cube has created a much simpler pricing scheme that is much easier for users to understand. V-cube’s new offering – “V-CUBE One” – is a service that looks to match the ever-changing business environment of customers and enable true flexibility of use. Combining V-cube’s best offering “V-CUBE Meeting”, “V-CUBE Seminar”, “V-CUBE Document” and “V-CUBE Sales & Support”, V-CUBE One can truly match customers’ business needs and maximize flexibility. Additionally, V-CUBE One also allows users to connect to telephone and video conference end-points as well as utilizing V-cube’s international network infrastructure – “Global Link”. On top of that, pricing is based on the maximum concurrent connection model (port plan). For example, a 10-port contract allows users to have two 3-people meeting rooms and one 4-people meeting rooms that can host meetings simultaneously, all the while users can also host nation-wide web seminar training sessions up to 10 participants. Moreover, V-cube will also begin offering its enterprise text chat service – “V-CUBE Gate” – a free chat service that accommodates enterprises with high-level security, department users management, usage log, and seamless connect to other V-cube services. - Accommodates enterprises with high-level security, department users management, and usage log. - Seamless connect to V-CUBE One. - Also available on smartphones and tablets. V-cube will continue to strive as a pioneer of visual communication services and offer new options to flexibly match customers’ needs. We look forward to providing the best visual communication services worldwide.